These words express the basic belief of Sikhs. To them idolatry is forbidden. True worship consists in singing God's praises and in meditating on His Name. Guru Nanak Festival is the most prime festivals of Sikh community in India.Guru Nanak the holy figure preached that almighty is Glorious, Formless, and cannot be represented by a mere icon or image.He is within the reach of all through prayer and the Path of Righteousness.To realize Him speculation is useless, and so are also all pilgrimages, fasting and celibacy. TheHolidaySpot is happy to bring you the event of Guru Nanak Jayanti with a plethora of resources-beautiful wallpapers, e-cards, recipes. We have certainly not missed out on the importance and origin of the festival and the sacred teachings of Sri Guru Nanak Dev Ji. So here's one more way you may observe the famous Sikh festival for peace and wellness with your loved ones. May He inspire you to achieve all your goals and His blessings be with you in whatever you do. Learn and know about the founder of the Sikh faith. 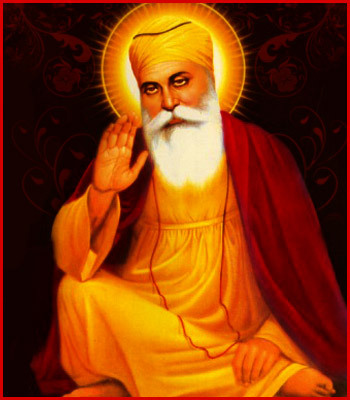 Wish "Happy Guru Nanak Jayanti" to your dear ones with these free e-cards. Know how this festival is celebrated by the Sikh communities. Pamper your taste buds with these sweet recipes on this occasion. Know about the five sacred Sikh symbols are commonly known as Panj Kakkar. Go over these wonderful quotes on the auspisious occasion of Guru Nanak Jayanti. Know the informations on Sikhism and the teachings of Adi Granth. A brief information on the teachings of Guru Nanak, the founder of the Sikh faith.